Phenomenal fishing is happening right now in the waters surrounding Panama City Beach! Beautiful weather and pristine waters are making sight fishing a breeze for a variety of inshore gamefish. Up on the flats in the skinny water and along the shorelines, scores of redfish are eagerly waiting for you to throw a jig in their direction. If you want to look for tailers, you should get out there on the low negative tides when the flats have very little water on them. This is also when you are most likely to see schools of fish “waking” as they cruise down the flats. As the tide comes in, you can also spot cast to fish that are laid up in sandy potholes or cruising down long sandbars. Lots of speckled trout have been hanging out on grass beds near schools of pilchards in water depths from 2-5 feet. The best concentrations of fish have been near drop offs, potholes and areas of good broken bottom. They have been actively feeding early in the mornings, so getting them to eat a variety of lures has been fairly easy. Topwater baits are a visual way to catch them early, but artificial shrimp are hard to beat. Natural colors are recommended in clean waters with “near clear” baits ranking right up there with the best of them. I’m also seeing good numbers of black drum, the less aggressive cousin to the redfish. They will eat a jig if presented properly and should not be overlooked as a sight fishing target. Their darker color makes them stand out very well against clean, sandy bottom so they are often easy to spot even in less than ideal light conditions. It’s best to slowly drag the jig along the bottom instead of twitching and working it erratically. 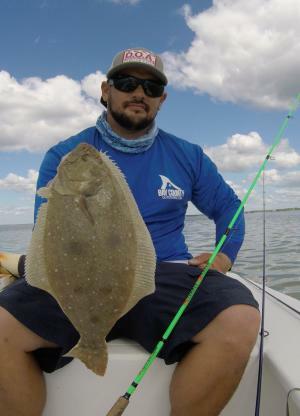 The flounder bite continues to be all or nothing. If you get on top of fish and you have a moderate amount of water movement, you can catch a bunch of them in a hurry. On the other hand, they have been concentrated in small areas so you could fish all day and not find any of them. Your best option is to drift over areas with either jigs or live bait rigged on a drop-shot rig until you get a bite – then slow down and thoroughly work that area. Remember, if you’re using live bait, you should give the fish a couple of seconds after the bite before you set the hook to ensure a successful hookup.